As one of the most popular male stars managed by Yang Mi’s (杨幂) Jay Walk Studio, Vin Zhang (张彬彬) has a large fanbase. The 25-year-old has been capturing the heart of fangirls all over the nation since co-starring in the 2017 hit drama Eternal Love <三生三世十里桃花>. His starring appearances in dramas such as The King’s Woman <秦时丽人明月心> and The Flame’s Daughter <烈火如歌>, both which also starred his label mate Dilireba (迪丽热巴), solidified Vin as the “number one brother” of Jay Walk Studio. It’s not a surprise to see Vin being the ideal type of so many women. The young actor is known for being low-profile, composed, and kind-hearted—but even then, having a large fanbase comes with many liabilities. And for Vin, a popular idol star, those responsibilities include staying loyal and staying single. Rumors of Vin being in a relationship started to circulate as early as late 2017, when an anonymous poster online broke the news of Vin being in a possible relationship. Due to the randomness of the post, fans didn’t think much of it. It wasn’t until recently when rumors of Vin’s relationship started to resurface again when fans started to react. Many big-name fans within the fandom have started to drop Vin like rocks, and many more fans are saying that they are disappointed in him. Vin’s alleged girlfriend does not only manage Vin. She also reportedly manages Jay Walk Studio artistes Daisy (代斯) and Maggie Huang (黄梦莹). After some more digging by the fans, they started to notice that Vin and his manager had actually been dating for quite some time. Sometime last year, when fans went to pick up Vin from the airport, they noticed that Vin immediately went to help his manager after seeing her trying to haul all of his luggage. “Let me do it,” he had said. At the time, fans praised Vin’s attentiveness and kind heart. In yet another airport meeting, Vin stood protectively behind his manager to guard her against the crowd of fans. Some fans also managed to snap a picture of Vin and his manager in the elevator, in which Vin had an arm around his manager’s shoulders. Vin or his agency hasn’t confirmed the relationship, but whether it is true or not, he deserves the privacy. I’m not quite understanding. So an idol is not allowed to have relationships? No one can seriously believe that they have to stay single forever? They are human, not a god. What they do in their personal time isn’t anyone’s business. Unless of course they are committing a crime then I don’t see why anyone should care? And to say that they are a fan of someone, they should be happy that they found someone suitable for themselves. They are not true fans then if they are willing to drop them like a piece of garbage. Sure, I’ve been disappointed in my favorite celebrity, but it doesn’t mean I don’t support them as an actor/singer. Unless they commit a crime, I don’t really care what they do in their personal time. Oh AHAHHAHAAHA How funny and stupid at the same time! Some fans are just so stupid, they need to stop dreaming that they will get to own these actors. BTW I actually dont believe it at all whenever an actor say they are not dating at all for even just a few months. The true thing about these celebrities is they constantly meet attractive people everyday and even random people are willing to throw themselves at them, the temptation is just too high. Very often, costars date each other very briefly. And that’s their own choice nobody can force them to stop. Do fans like it more when their idol lie to them about not being in a relationship? Seriously, who likes those stars who are willing to do anything, just lie about anything as long as they can stay famous (or, actually just keep lots of stupid fans happy) ? I can’t believe how pathetic people are to still believe some stars saying they’re still single after they were clearly caught with somebody multiple times already. These delusional grown women are not fans. They are living in some kind of fantasy day dream that Vin Zhang will one day marry them. These women are stupid to think that they stand a chance with these men. Another stupid thing is they ship co-stars and when these celebs fall for someone who these idiots did not ship them with, they harass the idol’s partner and find all kinds of imperfections with the person. In this day and age, you would think that these women would be happy that these young men have found a partner to care for. Noooooooo, they are stuck in lala land that these idols will sweep them off their feet. When the idols find a lady, and occasionally a guy, the delusional fools drop the idols like rocks, just like they did now with Vin Zhang. Maybe these fans should do something more worthwhile than spamming on social media or spending countless hours waiting waiting in airports…. Wait. Totally confused by the grammer in the article. Hers? His? So what if he’s dating. @bubbles23 are you talking about when Vin had the backpack and he said it is hers , (meaning his manager’s) not his?. Good to see you are in that sensible, real fan percentage. These womem are pathetic. What is sick is how they are trying to dictate Vin and his manager’s lives by telling the woman what she should be doing, and who she can and can’t date. Hey ladies, we have gone forward, too bad so many of you are stuck in a delusional 19th century world. Even if Vin is not dating his manager, which he is, he is not going to date any of you, or anyone you ship him with. Celine Dion dated her manager, married him and stayed married to him for many years until his death. That is shyte about being a young good looking star comes with responsibilities of staying single. These celebs do not owe the fans anything except giving them music., concerts, movies, dramas, fan meets, book signings and such. They do not need permission from the fans to date, and they should and can date whoever they want to. That is not the fans business. Although I’ll fully admit I can’t relate to the mentality of fans who idolize celebrities as I’ve never done it, news like this kind of reminds me of the saying “live by the sword, die by the sword”. It’s true that these celebrities have every right to do what they want and date whomever they want, and fans have no right to dictate what they can and can’t do. But at the same time, they chose to go the “idol” route, so they really need to prepare for the consequences when they deviate from the path that their fans want them to go. They can’t on one hand get all popular by taking advantage of the fans devotion to them, but then on the other hand go it’s unfair that they don’t have a “private” life. They most certainly can have a private life, and it’s not like fans are forcing them to not have a private life. They’re simply going to take back their allegiance if they feel “betrayed”, and not support the person anymore. And the fans have every right to. So in a case like this one, the guy can most certainly date his manager, get married, have kids, whatever. But if his fans stop supporting him because of it, he can’t cry about it either. That’s the path he chose to get to stardom. That’s how the game is played. @theyenman I respect your comment but I have to disagree with some points you made. You are right in the sense that Vin chose to be an actor. Yes, that is indeed the path he chose. Where is the contract drawn up and signed by him and his fans that he has to be loyal and single? . You are right to say that fans can stop supporting an artist if they so wish to. However to stop supporting an artist because he or she chose to have a lover or spouse is so sick and pathetic on so many levels. If an idol chooses to have a partner and fans take back their so called allegiance, then they were not fans at all, but crazy fanbots. Why?, the idol never signed a document or pledged to the fans to withdraw their (the fans’ support) if the artist falls in love. Vin did not take advantage of his fans. Being an actor is his job, and if he is looked upon as an idol by these fans, then so be it. He did not hogtie them and asked them for their support or allegiance, that was their freedom and will to support Vin. They saw a young, good looking male and decided to daydream about him for their own personal reasons. Cant these women understand that just because an idol does not say he has a woman does not mean he does not have one, cause they certainly do. Some even have a man. They should have learned from Mike He, Charlene Choi and Andy lau that just because an idol screams from the rooftop that they are single, it does not mean that they are. The problem is these deluded fans see what they want to see, believe what they want to believe, and when reality steps in, this Vin situation is exactly how they react. Vin did nothing wrong. He does not owe these so called ‘fans’ any explanation for his private life. The fans need to get with the program and face reality. If you disagree with me, I am open to a respectable, polite debate. @bubbletea Oh, I don’t disagree at all that some fans have unreal expectations on their idols. But again, my point is that at the end of the day, it’s the fans themselves who choose whether to continue to support the artist or not. If they drop their support because of stupid reasons like the celebrity is dating, then that’s their decision and their right. It’s not like they’re holding a gun to the guy’s head and telling him he has to stay single. They’re just saying they will take their money and support elsewhere because (in their minds) they felt letdown by the news. At the end of the day, this Vin person has to decide for himself what’s more important. Live up to unrealistic expectations of what his “fans” want and stay committed to being an idol without dating, or live with the decision to date and potentially lose those crazy fans. You’re right, there’s probably no stipulation in his contract that he has to be single (although, given his “idol” status, I wouldn’t be surprised if there actually was a clause in there that he can’t date). But because his current earning potential and popularity are tied to his idol status, he has to prepare to lose part of that if he decides dating is more important to him. If he’s ok with that, then he should for sure go ahead and date, and not worry about losing that crazier portion of his fanbase. @theyenman Well said and I agree Vin should not lose any sleep over the crazy fans. It is hard when an artist is elevated to idol status. Their agents/handlers make their lives near impossible by having these no dating clauses inserted in their contracts. That means more money for the money grubbing agents and studios. When they date, they are encouraged to lie to the masses, ” no, I do not have a boyfriend/girlfriend.” That is a cruel move enforced by their handlers. I can see why fans can become angry and feel they have been betrayed. However, if they are at least 19 or older, they should know that that is how the current ebiz system work. As @hetieshou would say, “they lie through their teeth.” Real fans , sensible fans who have no crazy notions would expect the denials or lack thereof from these idols about their love lives and just enjoy their looks and their movies, shows, dramas music etc, cause there is nothing wrong with admiring good eye candy. @theyenman Yes. Fans can be cray cray. Drop the idol status, and Vin wouldn’t need them for popularity. Many artists want to drop the “idol” label. It takes time. @tiffany Yes and I really dislike the idol status. I don’t know if they get pay more or something for having lots of followers on chinese social media? For someone like Vinn he is talented but have not had any breakthrough yet because of the lame roles he get in dramas. So in order to have many fans it was mostly because of the looks. He was the sole reason of The King’s Woman’s success, such a boring show to get quite good ratings that was his idol power. It is exactly the same thing for many idols today with tons of followers when their skill are so average, and that’s why I don’t even think having so many fans would even mean anything. It doesn’t define their popularity in a positive way. @davy well said. There is so much pressure with the idol status. You know, all it takes is a nice, slim body and a pretty face and these guys and girls are automatic idols, even if they have nothing to show that they have ptoven themselves. Mike He and Joe Cheng are perfect examples. They came on the scene, tall good-looking, with model bodies and they were instant idols. Their popularity was like pandamonia, it was insane when they were at the height of their popularity, all because of pretty faces and idol status.They jumped to leading man status in a New York minute. They made millions and the girlfans supported everything they acted in. They never bothered to improve their acting. To this day, they are still better models than actors, or in Joe’s case, singer. Why bother when a nice body and pretty face can get you millions of fans, notoriety and fortune. 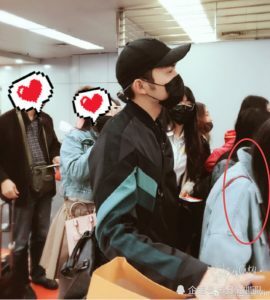 Shouldn’t these fans be happy that he is dating someone outside of the industry, and who might possibly be quite ordinary? Surely gives them more room for fantasy? I don’t think fans or anyone should harass or bully a celebrity’s significant other. I don’t think fans have a right or say on who their beloved celebrity should date or marry. Fans should respect the celebrities and their privacy. However, at the same time, if we’re going to expect fans to have boundaries, so should celebrities. Celebrities should at least be honest when they date and especially when they get married and have children. I don’t think it’s fair and quite selfish, actually, for celebrities to lie through their teeth about being single when they’re already married for years and have children. I mean, just be honest about dating/marrying and if that celebrity is dating a non-celebrity, fans don’t need her 411, but just an acknowledgment is good enough. Please don’t blame the fans that celebrities choose to lie about being single. We have many many celebrities who are admirable in telling the world that they’re happily dating, married, and have children. I’m sure we all know who they are. There’s no need for me to list any names, but a good example is the Prince of Idols, Luhan. He stood to lose a lot in admitting his relationship but he did it. I became a fan of his honesty. The world is constantly evolving, so are the fans and celebrities. 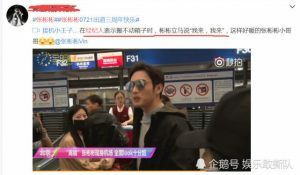 It seems like the Chinese industry has witnessed their celebrities date, get married, and have a family at earlier ages now and are pretty open, too. We will always have some crazy fans but the majority of fans today are so chill. Why else are these married or dating celebrities still able to thrive and fill up stadiums for their concert tours like Lee Hom and Jay? Talent? Sure, but we all know, there are many many talented people who aren’t recognized for their craft, but that’s another story. Oh, don’t forget, they may even gain more fans through shows like The Return of Superman. Ya’ll don’t give enough credit to fans. Fans are actually the most forgiving people. Hahah. Of course, we have those crazy ones, but they eventually fizzle out. Fans eventually grow up and mature, too. A lot of these fans who leave celebrities for dating or marrying are pretty young. They will eventually grow out of these stages and move on. I don’t think fans who leave celebrities for XYZ reasons are delusional. I just think, sometimes, as humans, fans look up to someone for inspiration or hope even if that is daydreaming about a celebrity. Having a crush never hurt anybody. Why do we expect fans to remain fans, forever? Hey, I ain’t gonna judge their reason for leaving a celebrity. It’s their choice. As long as they aren’t hurting anyone, they can leave whenever they want. Celebrities, too. They chose the public figure road, which means, you’re privacy is limited and your popularity depends on the support of fans. Perhaps I just don’t like liars, regardless of who you are and especially about a marriage or children. How do you expect to hide living beings? I will never understand. My friend is head over heals for Wallace Chung after watching General and I. Hahah, he’s like one of the celebrities left who still hasn’t admitted his marriage and daughter. I don’t see why he needs to hide them. He’s way into his 40’s. It’s to protect them? I see plenty of celebrity children who are just fine. Anyway, just my personal opinions. I know, they’re different and I’m not trying to make excuses for fans, but being a fan to many many people growing up and still being a fan to just random impressive people, I just think, almost everyone of us has been a fan to someone. We like them. They may not necessarily be the best person or the most talented, but we just like them and support them, genuinely, and may not totally be in a delusional way. Hahah. I just wanted to remind everyone before we start pointing fingers at fans for being nothing but no good delusionals that if fans choose to leave, then it’s up to them. It’s their hearts that are hurting, so if that makes them happier, go for it, just as long as they’re not harassing or doing anything bad to anyone else. Vin is 25 years old. His fans are probably younger than him. They’re still young. He’s still young. He’ll bounce back or maybe a small group of fans leaving him may not even dent his career. @lynn90 very well said. I agree with each point you make. I must caution though, there are still a lot of fans in their thirties and early forties who are still into fantasizing about dating and marrying their idols, especially the single or divorced ones. They are also still into shipping these idols with other celebs. They behave just like Vin’s ‘fans’ when these idols find someone. That kind of behavior is very unhealthy, especially at that age. Another mentally disturbing habit is bashing the idol’s partner and deciding that person is not good enough for their idol. While fans can decide to walk away from supporting a celebrity, it is their freedom of right to so, it is the reason why they choose to walk that leaves a lot to be desired. If fans angrily withdraw their support because their idol is married or dating, then something is so disturbing there. Yes, all fans are not delusional, haha, I use that word a lot, but there are still a lot out there past 25 years old. There are still a lot of fans out there still daydreaming about Aaron Yang, Jiro Wang, and Joe Cheng now that Mike He is ‘off’ the market. Well, I suspect Joe is going to be ‘off’ the market soon, and more grown women will cry themselves to sleep. I agree that some celebs are bold face liars. I just can’t understand why a man past forty would tell his fans how lonely he is, he has no one, ask them if it is alright for him to date and get married, when he is already married with one daughter at the time. I agree that celebs have their right to some sort of a private life. They should keep quiet or “no comment” if they do not want to divulge their partner or spouse, instead of playing cruel games with such lies on the fans they supposedly loveeee so much. Nuff respect to Luhan and others like him. Why hide and deny living human beings that you love. Vin will bounce back. He does not need those nutters anyway. Once again this is the image issue with Asian idols. The same reason the Ruco fans have toned down apart from the ‘I hate his girlfriend’ rants. The same reason Vincent Wong has no female fans because he married early. It’s no wonder that many celeb artists got frozen in the past for dating. With all that said though, I also agree that most of these fans will “grow out of it” eventually as they get older (unless they truly are crazy like the ones @bubbletea mentioned – the ones who are unstable enough to feel the urge to kill themselves when their celebrity obsession doesn’t pan out) — part of it is maturity but also having responsibilities (whether it’s work or family or the other practicalities of life) as well as less time on their hands to obsess over this kind of stuff definitely helps. @llwy12 first thing I have to say to you is, you are not old. The queen of England is old. Patrick Tse is old, and even he is still active, very active, even with the young women, lol. Don’t age yourself. I certainly agree with every point you made. I was on shift when they brought in one of the suicide victims in 2009 over the Andy Lau marriage becoming public. Still find it very troubling. He was with Carol since the end of the 80s and he had more than enough time to make it public. He did not because there ate reasons which I won’t disclose here. Sad thing is if her pops didn’t die, he would’ve still bern fooling thr public. Him and Wu Chun and Wallace cant remrmber his last name now. Wallace still jas not admitted. Still tries to deny his family’s existence. How sad and disturbing. I don’t only blame the fans, I blame the studios, agents, managers and the celebrities themselves. They are the ones who started this idea that if the celeb is single, then they are more bankable. That entails lying to the masses about their love lives. Say what you will about Hollywood, the idols let it known if they have a partner. The public can choose to accept it or not. I hope that Asians can fully follow that trend someday,…… Someday. Anyway, speaking of crazy fans….I read an interview that the infamous Andy fan (the girl whose father killed himself) did as recently as last month (May 2018) and it’s sad that 11 years later, she is still as delusional as ever, claiming that she did nothing wrong and continuing to blame not only Andy but also the media and everyone else who actually helped her fulfill her wish of meeting her idol (she claims that the meeting they helped organize was not a true “meeting” because all she got to do was take a picture with Andy…WTH??). She claimed in that interview that if given the chance, she would still like to “meet” with Andy….I hate to say it but honestly, that girl belongs in a mental institution…. R@llwy12 WTH?! That crazy woman is still blaming andy and everyone but the kitchen sink for what happened to her dad?! I don’t even think delusional does justice to her state of mind, she might even be too far gone for therapists, psychologists and psychiatrists. Why does she still want to meet Andy. She said it was not a proper meeting?, was she expecting him to take her to some magical room, with bed filled with roses, with wine, chocolate and strawberries, candlelight, soft romantic music, to have a intimate, magical interlude?, hahaha. What else could it be that she wanted, hahaha. What a delusional, ungrateful wretch. I too live in North America, but before I left Asia, my parents taught me so many things that make sense. They would often get into disagreements with friends, neighbors and relatives over certain things that they felt belong in the past as we as a universe should be evolving. They have no patience for shallow, fickle, snotty racist, unkind or heartless, lying people, and I am the same way. Our patience can wear thin with people who CHOOSE to be backward and ignorant. I have learned a lot from travelling the world. You made me laugh when you told me about the young Jacky fan. Isn’t it amazing that he has teen fans. His music, even the songs from many eons ago are timeless, just like Elvis. To answer your question…according to the interview, she wants to meet with Andy if given the chance in the future not because she is still obsessed with him (so she says) but because she wants to be able to tell him face-to-face how much he hurt her and how wrong he was to say that her irresponsible behavior which caused her father’s death was “unfilial” (I vaguely remember Andy releasing a statement at the time condemning her behavior)…at least this is what she says…who knows what her true motive is..
Here’s the link to the interview for those who are interested (I tracked down what looks like the original version of the interview reposted by Sina from one of the local Mainland media outlets, since most of the other articles I came across seem to be condensed summaries of the original interview). I don’t know about others but after reading through the full article/interview, the impression I got was that this girl (and/or the media outfit that interviewed her) was definitely trying to make her look like an innocent fan cruelly victimized by the entertainment industry – there was a “melancholy” feel to the way the article was written (I felt like I was reading a fiction novel) where I can see how someone not familiar with what happened back then would feel sorry for what she had to go through. It’s actually a pretty interesting read, though by the end, my opinion of this girl still hasn’t changed – in fact, all the interview did (for me at least) was reinforce the fact that this girl truly does have mental issues (and is delusional and creepy to boot)…I’m not surprised that Andy (or any celebrity for that matter) would want to get as far away from her possible…. @llwy12 WOW, I am speechless. However, I must first of all thank you for the link from Sina, thank you. At this point, Yang Liquan is not going to reform, no matter how much professional help is offered. She has made up in her mind since age 16 that Andy is the man of her dreams, even until now saving herself for him. Even after losing her father to suicde and going homeless , and she still blames Andy and the world for everything that went ‘wrong’ for her, she will never learn. Sadly there is no turning back for her. Sadly in the medical field, there ate always some who are never going to face reality and be rehabilitated. Yang is one of these peoplr, which is sad really. If Andy had diclosed his relationship earlier if it would have matter to her. However, it would have prevrntef the backlash with his other fa mnemonic s who he lied to and played mind games with for years. Another thing, what is with this thing about you are my family, I love you all and putting on this big act of pretending to kiss the fans’ backside. Akes mr wonder how much ifols like this, and there are quite a few, really looovee their fans. That is why I appreciate Tony Leung and Jacky Cheung. They both care about their fans and appreciate them without putting on some phony act. Also, from the get go, they were up front with the public about the women in their lives, and both were phenomenal actors, with Tony being the boss, and superb singers, with Jacky being the boss, good looking, young and talanted. Hey, they were at idol status level, and still were open about their love lives. This Yang has never dated, still waiting on a man who has a wife and children, I mean child, my bad. @bubbletea Yea, speechless is the right word for how I reacted as well. Literally Andy was the “man of her dreams” and she sure acted on that “dream” didn’t she? Yang obviously hasn’t gotten over Andy yet though – why else would she react the way she did when her co-worker first asked her whether she’s married or has any children? (I mean, what “normal” person would react that way simply by a stranger asking you if you’re married?) And when she talked about how she reacted when she “accidently” heard one of Andy’s songs again on the radio – all I can say is: CREEPY! Andy’s management company was right to refuse another meeting with this girl in the future (I was surprised that the media outlet actually asked his management company and they actually responded)…given this girl’s state of mind (and no, it doesn’t look like she ever sought any professional help in terms of psychologist / psychiatrists and stuff), I wouldn’t be surprised if she is on some type of secret ban list that prevents her from even entering HK in the future (not that Andy can’t protect himself with all the bodyguards he has but still…). One thing that came out of that interview that I think is relevant here is similar to what @lynn90 wrote in that the fans have the right to react the way they want to react, but by the same token, the celebrities have the right to live their lives the way they want to as well – provided they are not hurting/harming others. Sure, Yang had the right to have a crush on (if you could call it that) Andy but he also had the right not to reciprocate those sentiments. In Vin Zhang’s case, the fans have the right to no longer be their idol’s fan if they feel that their idol “betrayed” them by falling in love with someone that wasn’t them (as silly and stupid as it sounds) and of course Vin has the right to date whomever he wants (unless of course it’s specifically stipulated in his contract that he can’t date or he had told his fans he wasn’t dating but actually was). Whatever the case though, I think we will always have these issues with Asian fans because it’s so ingrained in the culture already. What? That stupid fan is still obsessed over Andy even after all these years and after all that has happened? What a stupid girl! She needs to get locked up in a mental institution epabd never get let out. Oh gosh I feel old too. My oldest build around the same age as my childhood idols. Boy that Andy fan is beyond crazy! Who would not want to run as faraway from her as possible. I bet she is not even married and still fantasizing about Andy. She still has the nerve to blame Andy!? What a stupid idiot! Oh well, no one can be an idol forever. These crazed fans will jump onto the next young hot fresh meat up and comer soon and this one will be forgotten…. Fans come and go. An actor cannot just rely on the whims of some fans. If he or she builds a good a fine reputation for himself/herself coupled with good works, they can survive. Vin is still so young. He has alot of time to rebuild his fan base. Some actors do not like to reveal their relationships for fear of losing fans. @mangotango The worry is not fans. Its his management and endorsements. Probably he will lose millions or a couple of contracts. Lol, I’m not surprising by Vin’s fan’s reaction on this news. Just saw a few comments from his fan based while watching the flame’s daughters, his fan base seems to consisted of really young teenagers. These girls need to grow up and give their idol some spaces, their obsession is why their idol don’t havea happy life, and still single at 40+! seriously crazy teens. this guy sounds like a pretty attentive bf, one’d think that’d actually buy him more fans instead of losing…. I don’t understand this logic. So basically, they just become a fan of the guy not because of his talent but because he’s fresh and hot. These fans are really delusional, do they really think he would end up marrying one of them? @reece0919 You said you can’t understand this fan’s logic. Of course you can’t, cause there’s no logic to understand, lol. To answer your question, yes, these fans are convinced they each are the ONE who will marry their idol and live happily ever after. Just hope none of them don’t commit suicide like when it was disclosed that Jackie Chan was married. A twenty something year old committed suicide in 2009 where I live when Andy Lau’s marriage was made public. Another delusional thirtyone year old was admitted to the hospital for attempted suicide over the same issue. It is not just the teens. Will not surprise me if most of these Vin Zhang ‘fans’ are around twenty to twenty seven years old. @bubbletea well, to them that is logic haha It’s really crazy out there. I’m a fan of idols but I never get to that point of killing my own self just because a person found happiness in their life. These people really need to find something they could do in their life other than obsessing over these actors. @reece0919 makes no sense getting to that point. Maybe @IIwy12 is familiar with sean Cassidy and John Stamos. So many young girls and young women had crushes on rhese two. I am talking about millions. They adored these guys. They had the life size posters of them in their rooms and any products associated with thir names. It was crazy. Thing is, my older frieds tell me that Sean Cassidy’s devoted girl fans who were crushing on him had boyfriends, so did John stamos’ girfans. Some even married those boyfriends. There is nothing wrong with having a crush, or daydreaming about your fav celeb. What is wrong is when a guy or girl does not want to date because they have it in their head that they will meet and marry so and so, when the the crush becomes obsessive and psychotic. When they will harass or physically harm or lash out at anyone who says anything negative about their idol, even if it is the truth. When the celeb becomes their GOD, the centre of their existence, their world. When they refuse to date anyone, cause they are waiting for their celebrity sweetheart to sweep them off their feet. That is when it becomes creepy. Again, nothing wrong with having a crush, but dont get delusional and creepy about it. @bubbletea Don’t know about Sean Cassidy other than him being the brother of David Cassidy from the Partridge Family. As for John Stamos — I used to be a huge fan of Full House back in the day and yes, like everyone else back then, I also had a crush on Uncle Jesse (honestly, who didn’t back then, lol?). Of course after Full House ended I grew out of that phase like everyone else and nowadays, I don’t even follow Hollywood much anymore. 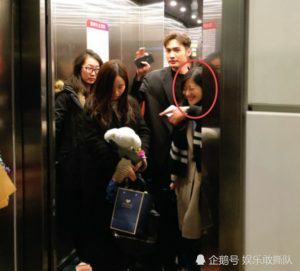 But for sure, the culture is very different — there are tons of teen idols and heart throbs in Hollywood with legions of fans following their every move, yet there are rarely any instances of fans like Vin Zhang’s who decide to “un-fan” merely because he is in a relationship (in fact, I don’t think it would be a stretch to say that kind of mentality is unheard of here)….it probably has to do with the Western culture’s more open attitude toward relationships and such (of course not saying there aren’t any crazy fans here in Hollywood because there are plenty, but the “craziness” is definitely on a whole different level, lol). @llwy12 my bad, I meant David Cassidy. Like John Stamos, he was one celeb that ladies crushed on for sure. It was all about uncle Jesse’s hair, his style, have mercy. Another super crush was Henry Winkler, the Fonz from Happy Days. He was no uncle Jesse in looks, but women gravitated towards him. He just had it. Of course Hollywood has its nutters, but the extent is not as drastic as in Asia. I beieve if the open concept of not hiding the other half was allowed way back when, this obsessive, delusional mentality would not be so rampant. @reece0919 I wonder what has conscience got to do with anything? @reece0919 Interestingly enough, that sentence (“there is nothing inherently wrong with being in love”) is eerily similar to what that crazy Andy fan Yang Liquan said in her most recent interview about her feelings toward Andy back then….funny how that same sentence can be used to “justify” two completely opposite fan reactions (leaving an artist vs obsessing over them). Yes, there are definitely fans out there who think that their idols will marry them….as sad as it sounds, I do understand teenage girls thinking that way, as they are young and inexperienced and for most of them, their notion of love is probably what they see in movies and TV series (which we all know is rarely a reflection of real life). Most will end up changing their mindset as they grow older and actually experience life. The really sad cases are the ones who are truly not right in the head (i.e. that Andy fan) where the passage of time and age (getting older) do little to nothing to change the immature thoughts of their youth. I’m actually interested in what Vin Zhang and/or his management company’s reaction is to these fans leaving. Personally I would think “good riddance” but most likely that won’t be the reaction, as they probably have to be PC about it, at least when facing the public. @llwy12 Knowing the industry these days, they would prob. force the two to break up or worse fire the manager if more people lose their interest on him. It’s really sad. Oh my gosh, they still interview that crazy fan? Is she at least working now and stop fantasizing about Andy now? She was a nut job. I agree that it is normal for teenage girls to fantasize about marrying their idols as they are still young and need to mature. However, they need to grow up and experience life more and grow out of that stage. Sadly there are crazy fans like that Andy fan who have mental problems cannot get over that. My late friend said she looks crazy too. Those fans are still young and immature so do not understand true love and life yet. Fans are shallow and disillusioned to think that they will have a chance with their idols. But I must say that there are some fans who have ended up with their idol. It is rare of course but has happened. However,that does mean that fans should fantasize about it either. I don’t follow vin but I do think he’s a good actor. I know some celebrities like to keep quiet about their private lives, but I respect and like them a lot more when they willingly embrace their other half in public. The fear of doing so or maybe the need to be private does more harm than good imo. Look at Andy Lau and the backlash he got from lying all those years. It’s this need to hide things that fans look down on, I think, rather than actually having a partner. Charlene Choi had the same situation. So if he was with another A lister actress or singer? Would fans say yeah? Or is it because he’s with his ordinary nobody manager? And what’s with dating managers anyway? Keep romance and business separate. Anyway out goes one group of fans, and if he is as talented as many says he is, and as good as he is, believe me, there will be another group, he can cater to another sort of fans. There’s always replacement fans. Not like he raped someone or did some deviant stuff. He can survive this. But I do doubt the idea of dating his manager. @funnlim Excuse me??!! Ordinary, nobody manager??!!. That comment was in bad taste .FYI, a celebrity is an ordinary human, male or female who has more money than some people, and more fame than most. That does not make them better or more special than anyone. Had it not been for the ordinary manager guiding them, or the ordinary fans supporting them, they would be starving artists.Is this the way that Asians view celebrities, as so above anyone else? No wonder that when they find a partner who the masses think looks too ordinary, or whose bank account is too ordinary (not enough money), they lambaste and criticize that person, even if the person is another celeb, the abuse and unacceptance is worse when the partner is not a celeb. As for dating his manager, he can date whoever he wants to. Last time I checked, he was over 18 years old, in fact, he was even over 21. This is such a complicated issue. If they lie then they get backlash but if they announce their dating status, this happens. If they get suspected of dating, he’ll breaks loose like in this case…sigh..
Anyways, I think with Vin one of the reasons is he is still too young. I bet if he was at least in his early or mid 30s fans would be more accepting since they would be more mature and he would be more mature. Most need to date, marry and have kids so who can be single forever? These fans are still too young to understand that which is sad. Hopefully with time they will mature more and be more realistic instead of being so ideal. Many fans are ideal about having on screen couples being together in real life too. Sadly onscreen and real life are two different worlds.